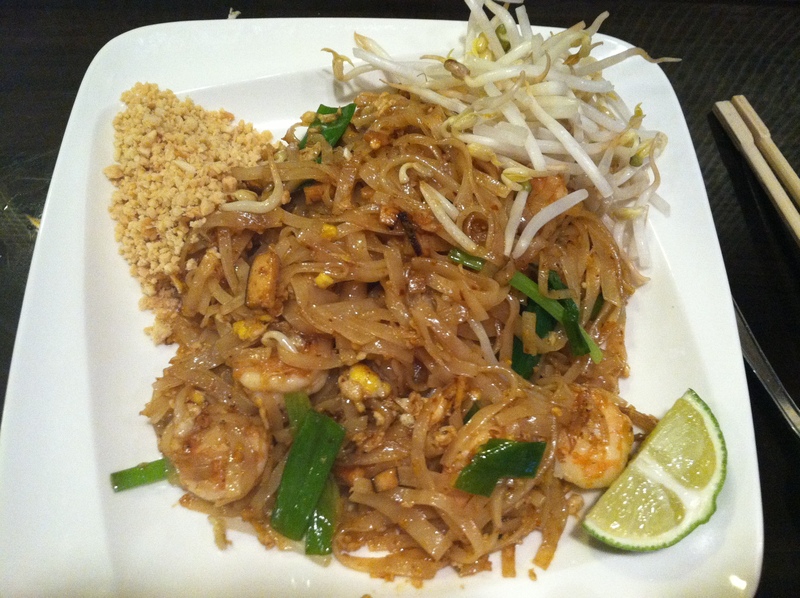 Laverne is an excellent place for Thai food and the only place to get anything close to authentic Pad Thai in Great Neck. 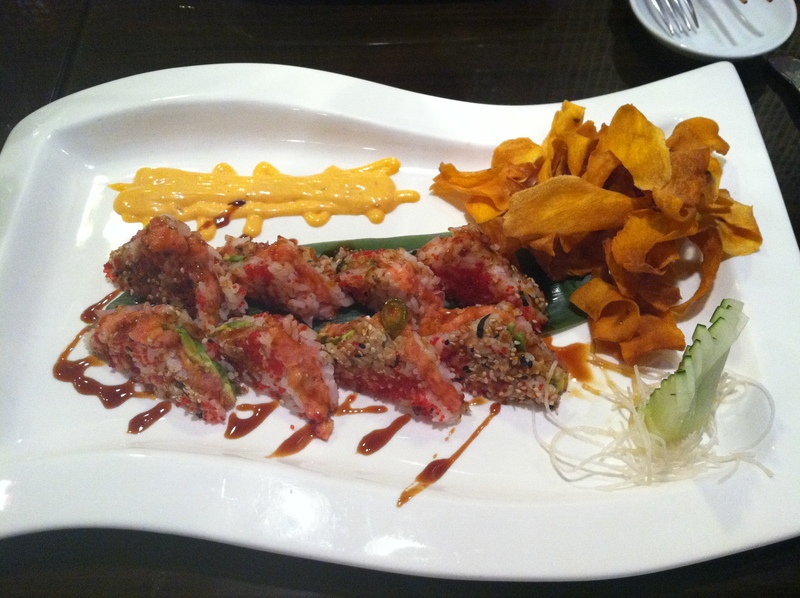 Their menu contains creative concepts such as Sushi Pizza and Tuna Sandwich Sushi which are definitely worth a try. If you haven’t heard of Laverne of Great Neck you’re not alone. As of the date of this writing, it’s only been open under this name for four days. You may know it better by its previous name: Bangkok Station. It had only been open under that name for only a few months, my guess is that the owners wanted to expand beyond just being a “Thai Restaurant”. They have since added Japanese and “French Fusion” fare to their menu. More on that below. Laverne is located at 9 Cutter Mill Road, the site of the old Empire Kosher Roasters / The Wok. When the new owners took over the space, they completely redesigned it. Whereas before that space had a “cafeteria” feel about it with bright orange chairs, when they redesigned the space for Bangkok Station they completely overhauled the decor. Now, the decor is much more understated and elegant in its simplicity. Yellow and red track lights overhead provide good lighting. The one new thing I noticed since the days it was called Bangkok Station is the addition of a sushi bar in the back. Now with Daruma, Chez Kama, Matsuya, Carousel, Sushi Palace, Hinata, Naru, Masago, and others I probably missed, Great Neck probably has more sushi restaurants per capita than just about any city in the world. Does it really need another one? This is definitely a case where you can’t have enough of a good thing. 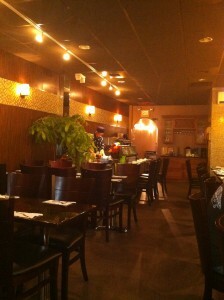 I was intrigued by Laverne’s reinvention as a Thai, French Fusion, and Japanese restaurant. In all honesty, the only “French” dishes I see on the menu of entrees were a Filet Mignon and a Rib Eye steak. For the appetizer, there were a few other “French-like” choices, including cajun shrimp, black mussels, and a duck breast appetizer. I ordered the duck breast, which reminded me of a mini “duck a l’orange”. 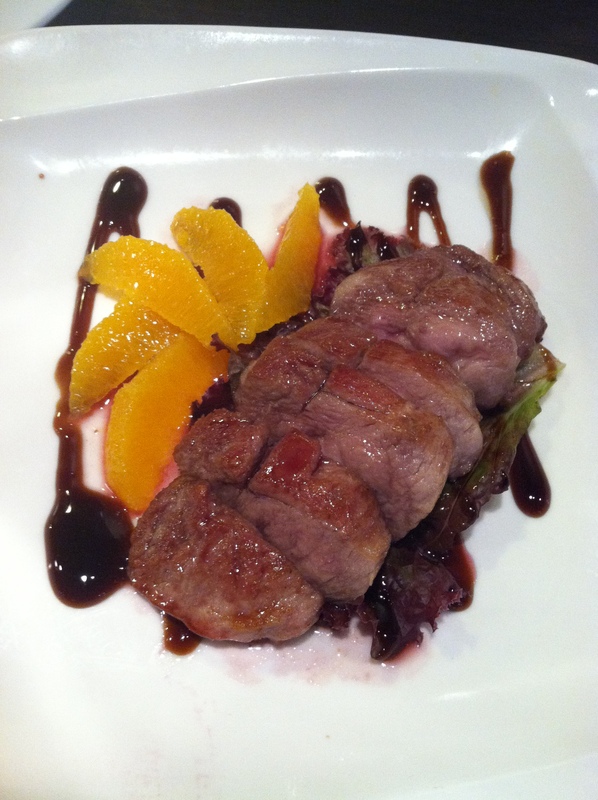 The duck breast was cut into large chunks which were prepared very well, juicy and with a subtle duck flavor. The sauce was a sweet and tangy fruit sauce made from oranges and raspberries, and carefully cut wedges of fresh orange completed the presentation. I was disappointed that my plate didn’t include the “puff pastry” mentioned in the menu, though. Whenever I go to a new Thai restaurant, I always order the Pad Thai. To me, that’s the barometer to test one Thai restaurant versus another. Bangkok Station’s pad Thai easily ranked among the best I’ve had, and happily Laverne continues the trend. The noodles are dry, the way they should be. Their pad Thai is of the “yellow” variety using a fish sauce base (not the “red” variety based on tamarind juice–or more commonly here in the United States, ketchup–blech!). The flavor is excellent, not overpoweringly fishy as other restaurants tend to make it. They mark the dish as spicy in their menu, but the last time I came I found it not to be spicy at all. Because we really, really like my heat, we asked them to make it extra spicy. They came through (and happily, my water glass was never empty, the server did a great job of making sure it was always full). I was eager to try the “Japanese” part of the menu, so I asked the server which sushi roll was the most popular. Without hesitation he said it was the “Big Tuna Sandwich”. He even said that people have ordered it, and then ordered another one for home. We decided to try it. We were not disappointed. The roll consisted of spicy tuna, avocado, and fish roe, topped with little green sliced hot peppers that gave it a nice kick. The presentation was beautiful–they did look like little “tuna sandwiches” with outer “slices” of rice (peppered with red caviar and black and white sesame seeds), and between them the spicy tuna and avocado. The spicy mayo on the side makes an exquisite dipping sauce, and you top off the meal with a side of “chips” made of sweet potato. With so many sushi restaurants in Great Neck, I think the successful ones are going to be the ones who differentiate themselves, whether with their freshness, their service, or their creativity. As far as creativity goes, I really like the things I’m seeing out of Laverne. When we went on a Sunday night it was pretty quiet, and we noticed the owner sitting at a table at the end of the room working with the sushi chef on taking photos, probably for a new menu or ad campaign. 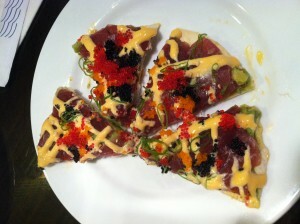 The server asked if we’d like to sample a new dish (not on the menu yet) they’d just photographed called “sushi pizza”. We were treated to the dish you see here–with fresh tuna, three kinds of roe, spicy tuna, and avocado, all arranged beautifully on, of all things, a tortilla chip! It’s this kind of fun that makes me want to come back to Laverne again. As for the service, it was excellent. The server smiled, was extremely helpful, and always made sure our needs were attended to. When we entered and exited the restaurant, the server and the management were very kind to us (and no, they had no idea I’m a blogger). From early indications, I think Laverne is one of the bright new entrants to the Great Neck scene.